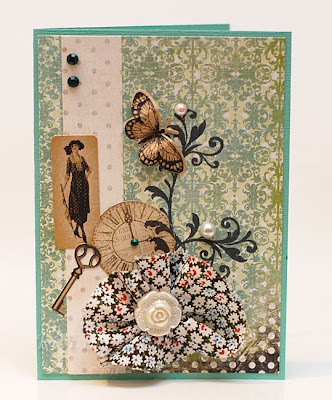 I have to say, the April Country Farm Stand kit at Pixiedust Paperie is AMAZINGLY versatile! I mean, seriously, I can’t believe how one project looks so totally different from the other! This card is all about vintage collage. 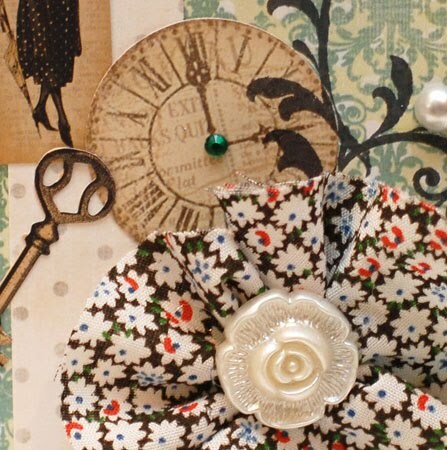 I wanted to really show case how all these fun elements, buttons, tags, stickers, butterflies, fabric and more can be tied together to create a really fun fresh take on vintage. Here’s a quick close up of the “clustered collage”…I almost want to make that a new technique – Clustered Collage. Take all the bits and pieces and just arrange them until you feel you have a balanced collage and then place it in just one section of your project. Voila! You have a clustered collage!